Congratulations to Andre on having a 30 game hitting streak. The hitting streak ended on the second game at Citi Field but Andre got back to hitting on Mother’s day when he belted his fourth homerun of the year. Andre also had a single so is nice that Andre is back to hitting. During the 30-game hitting streak, he had the other three homeruns. The most important thing is that the Dodgers were able to salvage one game with the Mets. Is on to beautiful PNC Park now to play four with the Pirates. I’d like to go back to PNC again as the only time I was there, I was only able to watch one game, stay the night and fly back to LA the following morning. . I have not been updating my blog as often and not visiting the blogs. We had a dead in the family. My dearest tia (aunt) Nena passed away with Cancer. May she rest in peace. Tia Nena was never a baseball fan. She would ask me how I had become such a fan when noone in my family was a baseball fan before. Another reason I have not updated my blog is I have not been feeling well but I am going to try to get back into the swing of things. I got to get ready for all the exciting upgrades to all the Fan MLB blogs. We have all seen it with the Pro blogs. Now is our turn! 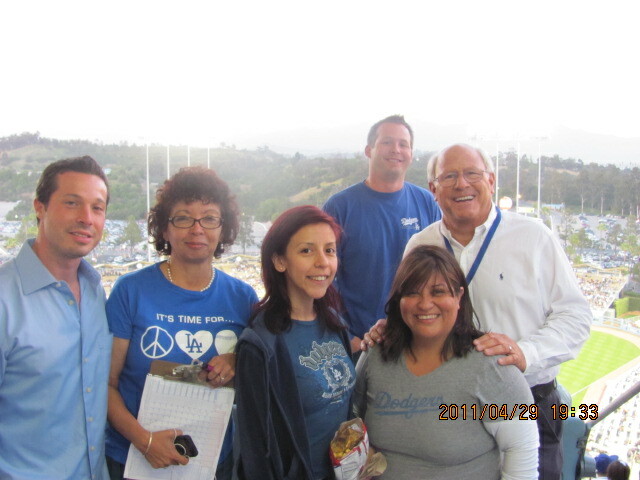 During the last Dodgers homestand, I got to meet Steve Soboroff who is the Vice-Chairman of the Dodgers. . My friend Lorena had invited him to come and talk to season ticket holders in the Top Deck when she read that he was going to be viisting the Pavilions so he showed up with Drew McCourt. In the picture, Drew, me, Gaby (Lore’s friend),David (we had a good laugh ’cause he snuck in the picture), Steve Soboroff and Lorena. Steve and Drew asked us for stadium suggestions so we offered some suggestions and since they had to go, they asked us to email them suggestions. The following day, during batting practice, we noticed a white hair gentleman that Deuce’s dad _William thought it was Tom Schieffer. 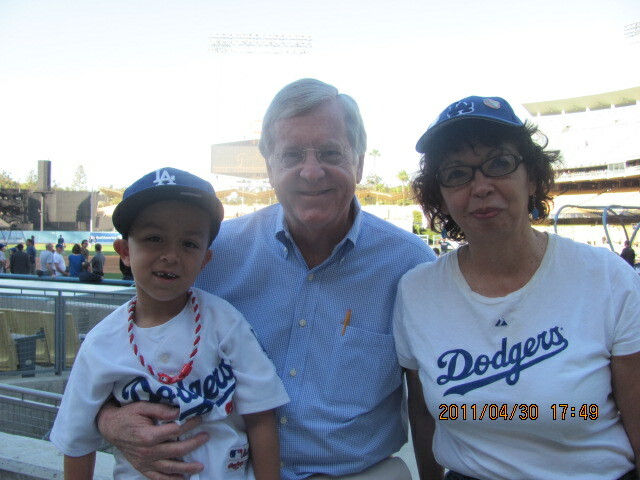 Currently, Schieffer oversees the operations of the Los Angeles Dodgers on behalf of the Commissioner of Baseball. Sure enough it was him. His security guy was close by. We talked to him briefly and snapped this picture. So sorry about your aunt, Emma. My condolences to you and your family. Hope you’re feeling better too! Sorry for your lost Emma,My condolences to you and your family.Very nice pictures by the way. My condolences for the loss of your tia. I look forward to reading more of your posts and seeing all of the great pictures you include. My condolences on the loss of your tia, Emma. That’s so hard. I hope you feel better soon too. I think the blogging comes and goes for all us when life outside of baseball needs to take the front seat for a while. We love to read what you write whether it’s once a month or every day. Thanks Jane. I am feeling much better. Thanks Ron. I have some pics from the SABR meeting that I went to two Saturdays ago. I think is going to after we get upgraded that I’ll post them. You are so sweet. Bet we here are looking forward to playing with the new toys of the MLb upgrade. Now, can you give me back Scioscia? Ok, just kidding. Yeah! We are back. I am at Dodger Stadium now but was checking on status. thanks Mark! Thanks Mlb employees!